My dear wife and I used to get this dish at a little palapa-covered restaurant that sat right on the Caribbean. We’d order the Ceviche de Camaron, a couple of margaritas, and just sit there staring at the incredibly blue water and sighing. Since we’re looking at up to a foot of snow and single-digit highs this coming weekend, it seemed like a fine time to make this dish. This is an Acapulco-style version, so it has some Spanish and American influences. 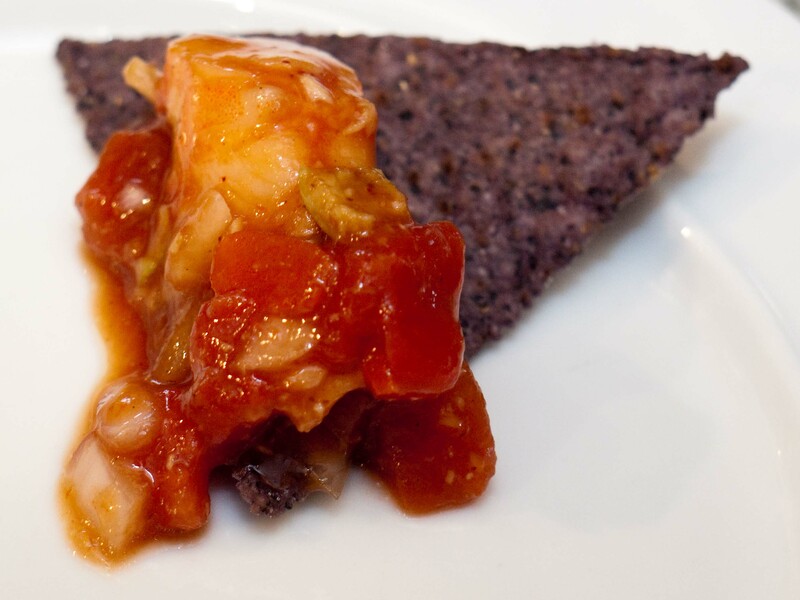 The shrimp is pre-cooked, not cured in lime juice, and there are some odd ingredients like ketchup, olives, and horseradish that aren’t found in traditional ceviche, but it has a great taste and is always a big hit as an appetizer. Chop shrimp into 1/2 inch chunks. In a large, non-reactive bowl, combine the shrimp, salt, and lime juice. Let sit for about 5 minutes. Add the onion, cilantro, ketchup, jalapeños, oil, Worcestershire, horseradish, hot sauce, and olives. Mix well and let sit in the fridge for about an hour so the flavors can develop. Check seasoning and top with avocado cubes. Serve with lime wedges, tortilla chips or (strangely traditional) saltine crackers. Spicy, tangy, and sweet with a good fresh shellfish flavor. This was so good I could almost feel the sand between my toes!